So today I sat at my new desk and was playing with an oldish design with the view to putting it up for some test tatters to try. I needed my trusty hook and, as usual, it was nowhere handy. Also on my desk was a hook fob I had made some years ago out of a necklace I had bought in Denmark. I rummaged around and found a few other bits and bobs and got totally distracted from my original intentions for the afternoon! 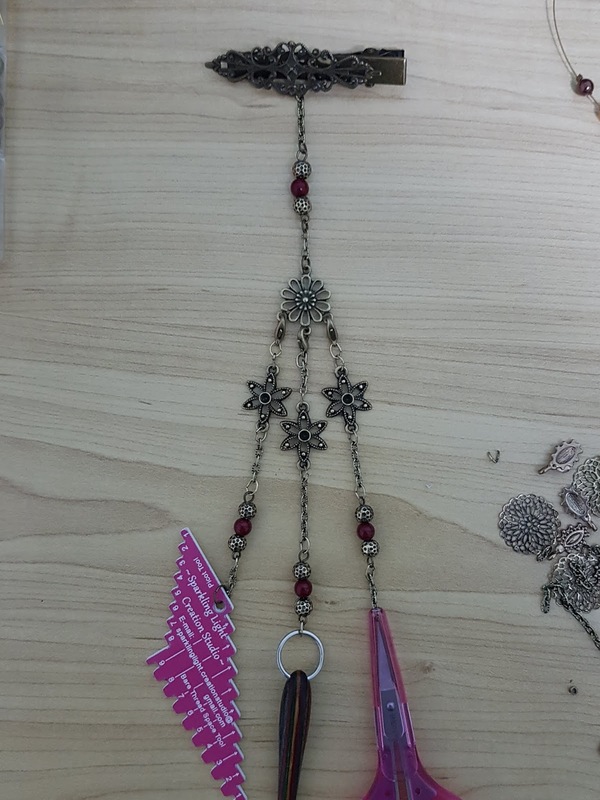 So.....I grabbed an old necklace I had been keeping for the beads and pulled it apart to make a fob for my smaller size hook. In the process I thought.....a chatelaine would look good in this design.....hmmmm. Thus, an original chatelaine was born. Then I finally made the fob I had originally intended years ago with one of my favourite old earrings! By the time I finished it was WAY too late to tat. But in all a very productive day!